With more apartment housing and hotels being approved and built in the City of Adelaide, councils are creating more leisure options and greenspace improvements for residents and visitors. Pelzer Park has been funded by the State Government and costs a whopping $5 million. The activity hub includes new dog parks, the Marshmallow Playspace and many other recreation facilities. The large innovative space is located at the intersection of South Terrace and Glen Osmond Road and is really worth taking your family for a visit. The park was officially opened in late April 2018. 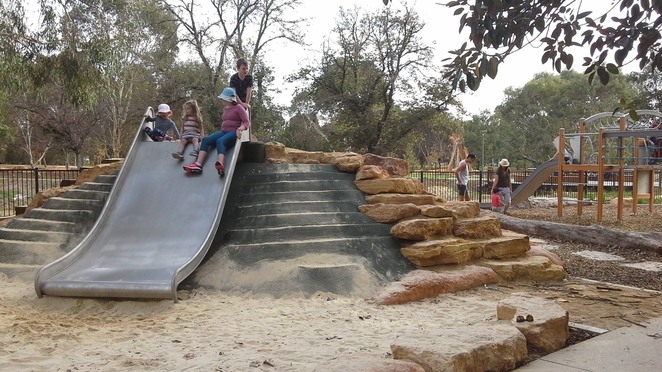 Fun new equipment for 3-12 year olds in the enclosed playground. The highlight of the Pelzer Park/ Pityarilla Activity Hub for young kids is the Marshmallow Playground. 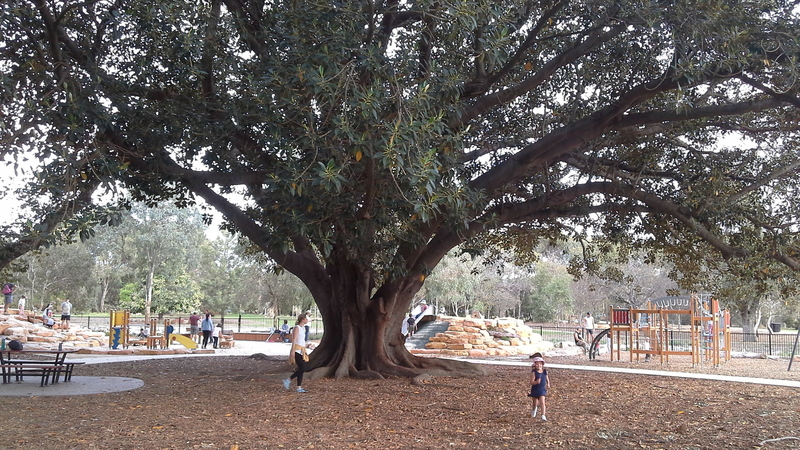 It is a fenced space, built around a huge old Moreton Bay fig tree. This provides a lovely shady and sheltered space to run about with bark chips underfoot. 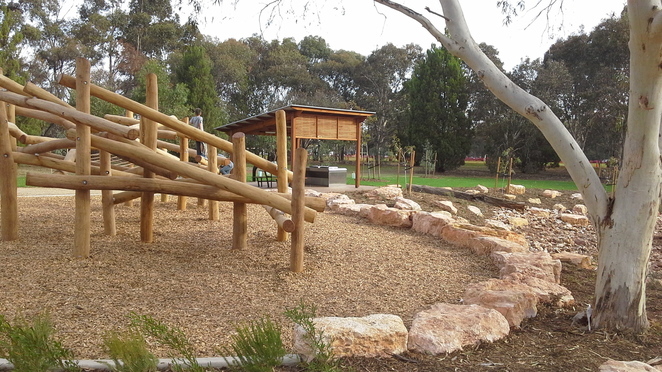 Around the outer area of the tree is all new climbing equipment, with slides, sand play area, and a water play area. Plenty of space here for toddlers to ride their wheelie toy cars or scooters around the walking paths. It will be hard to tear kids away from this park to go home, there is so much to enjoy. Marshmallow refers to the weedy tall large-leafed plant that is commonly referred to as marshmallow. The Kaurna people call this area here Pityarilla, meaning marshmallow plant. All weeds are now long gone in this revitalised area. 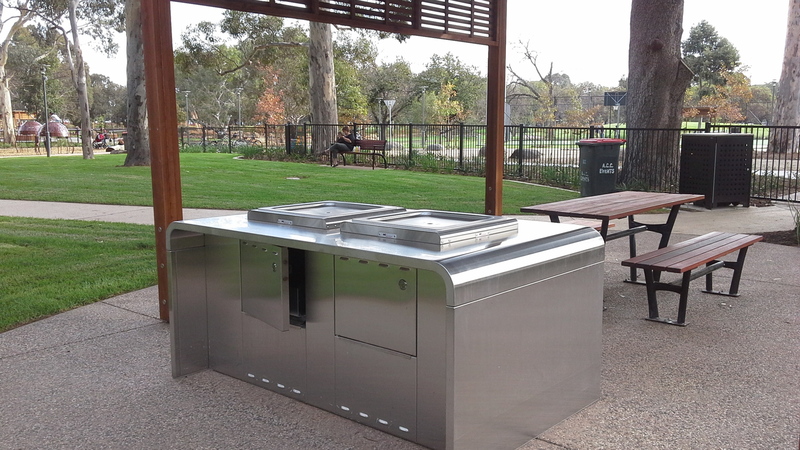 The park has been designed to be a central point, or hub, for the many walking and cycle paths connecting the southern city fringe suburbs and the many tracks in the south parklands. You can begin a bike ride here or walk on new pathways with many resting spots. Facilities here include toilets, BBQ and shelter spaces, and includes the Marshmallow Playground close to the road. Nearby are two new dog parks, one for small and one for larger dogs. This BBQ shelter looks inviting for a family day in the parklands. Image by Kat May. Also at the hub is some basketball and tennis courts, for use by locals and visitors. These have push button timer lights so you can play at dusk and still see what you are doing. Perfect for meeting up with your mates to shoot some baskets after work or study. There is really something here for recreational use for all ages. There are many free city bike hire locations nearby so pick up a bike and cycle towards here. It makes a pleasant spot to have your lunch, especially further south near the huge new climbing frame. Here it is further back off the road and quieter. The huge climbing frame at the rear of the hub. Image by Kat May. Outside of the playground and further along the pathways, you come to a creek bed, which has some water running through it in winter months. In hot weather, it is a dry creek bed. 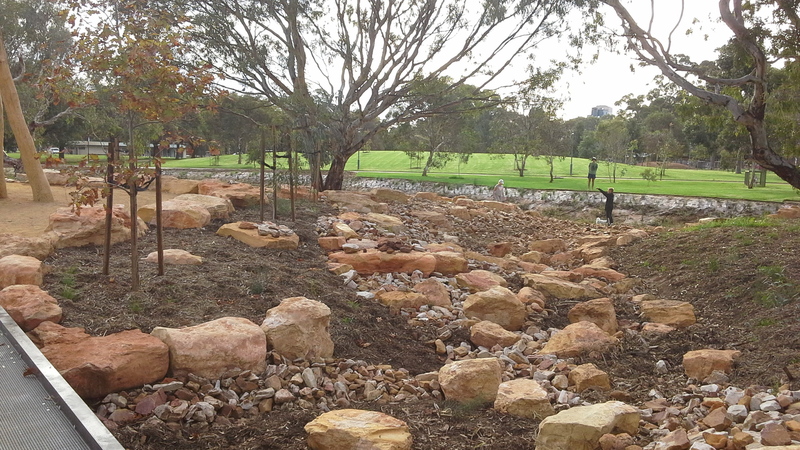 Lots of money has been spent here, covering the creek and banks with rocks and it looks really good with different coloured sandstone rocks of various shades. When it is dry kids can clamber about on the rocks and play. Near here is a huge climbing frame only suitable for much older children or teens. It is made from smooth old tree trunks. Beyond here the walking paths head across the parklands. Pelzer Park scenes. Image by Kat May. 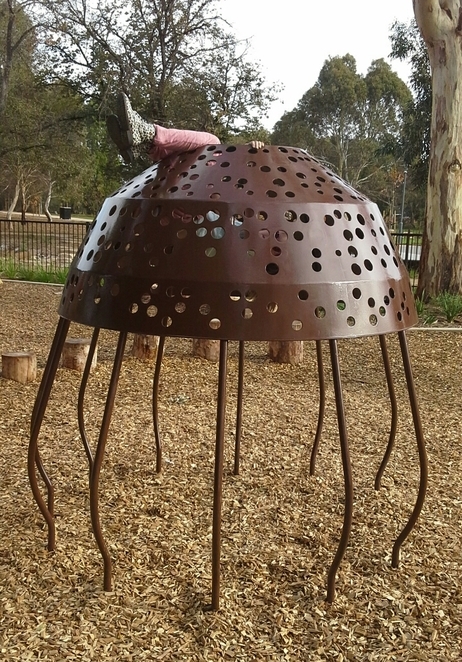 Continue on from Pelzer Park with a walk or cycle east, to discover the large stretch of heritage sugar gum trees along the no through road of Beaumont St, just off South Terrace near the end where it connects with East Tce. These trees are original native old growth trees that have been here long before Adelaide was settled. There are small tracks to walk or ride to the trees through the parklands. Hanging out as kids do at Pelzer Park. Image by Kat May. 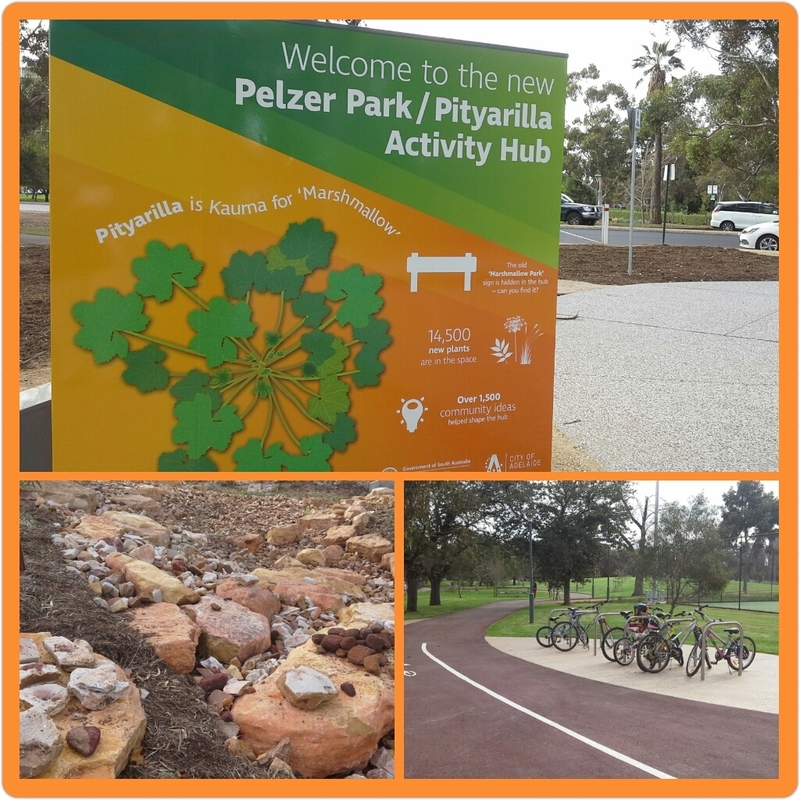 Pelzer Park is an easy walk of about 10 minutes for an adult, from the South Tce tram stop. It is a free ride to here from any city tram stop at all hours. 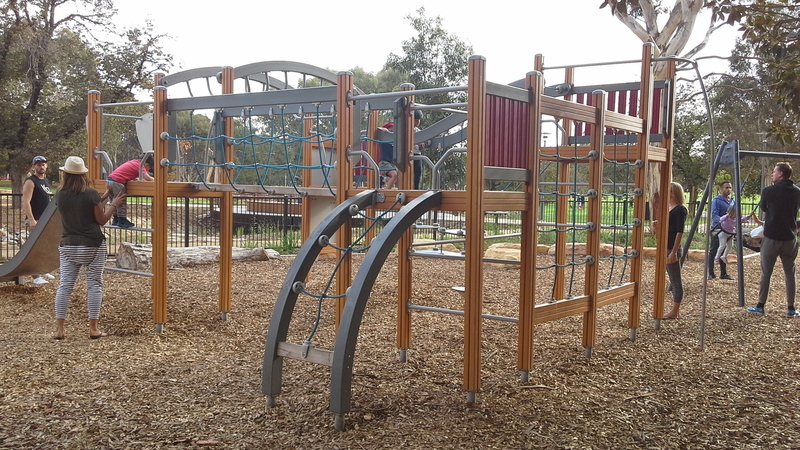 Walk east along South Tce and you will pass one of the Clover Playground, which is more suitable for very young children. Then you pass the new Pelzer Park dog parks and then the Marshmallow playground is next to that. Bus is 170 Mitcham or the Mt Barker hills bus. You can catch this bus outside the Myer Food Hall on North Tce or on King William St. Get off the bus as it turns onto Glen Osmond Rd. Alternatively, parking is only available on the street. There are no facilities such as shops nearby so take a basket of afternoon tea and water. A visit to Perlzer Park is a must for growing Adelaide kids and their families and makes a fun area to explore on a scooter or bicycle. 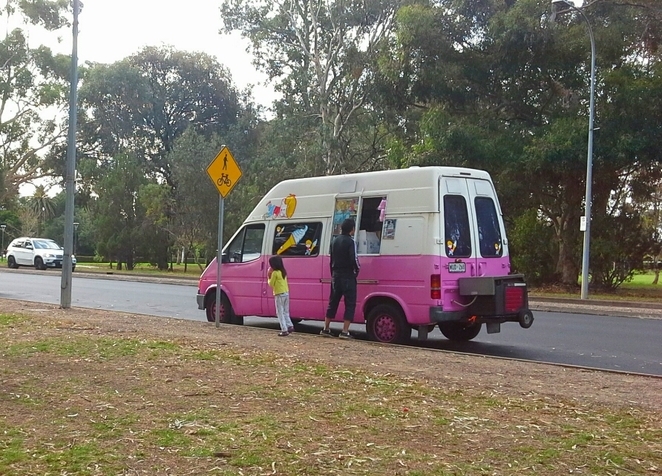 If you are lucky, the ice-cream truck may be on the roadside on weekends, which may be your only way to get the kids to leave this magical new playspace in Adelaide. We are in luck. There's the truck. Image by Kat May. Why? A place for all ages out in the fresh air.